I dunno what they are offering there, but I don’t want it. Their chopsticks must be acupuncture needles. 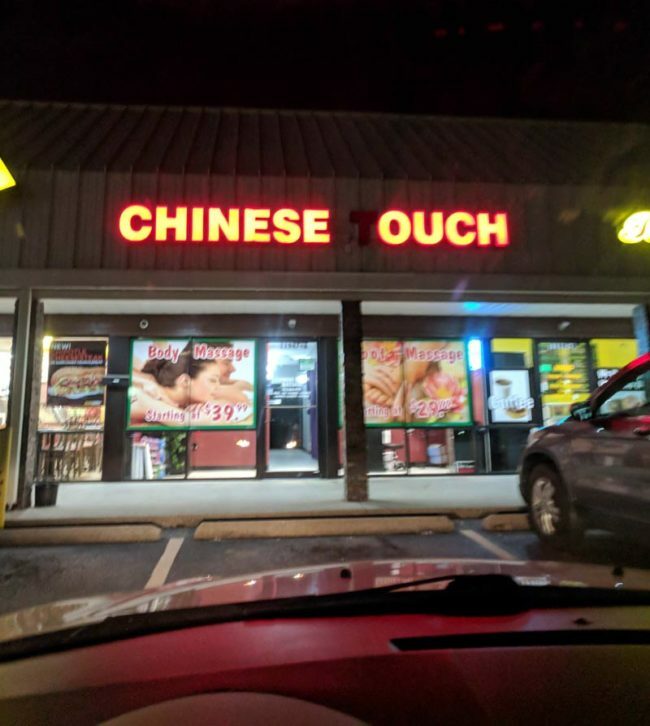 Not at all sure the “Chinese Touch” would be much better. Uhhh…what Jackie Chan will give you if you are stupid enough to try to mug him? It’s the Chinese variation of a Brazilian waxing: the wax is denser and takes a lot more effort to pull loose from the skin. “Let me know if I press a little too hard,” my masseur tells me. So my natural reply when that happens is, “OUCH!! !” But he’s not Chinese, so I don’t know if that’s applicable. How can you knock “truth in advertising”?